Men like Jack Imperial and Arthur Brown wonder why they didn’t come up with the concept of a Larry Gannon Building Association, a non-profit to manage the golf course and its accompanying clubhouse business, sooner. Like 10 to 15 years sooner. “Better late than never,” Imperial, a charter member of the seven-member Association and its unofficial general manager, quipped, referring to the actual start year of 1981. 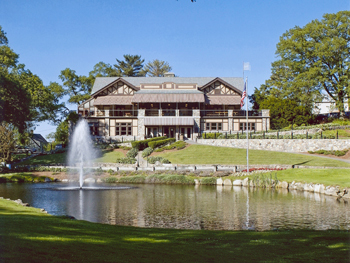 “The key is the Association has served the course, the membership, the public and the city of Lynn well ever since we started.” As Foster noted earlier, the Association was informally organized one night in Brown’s cellar, when a group of golfing regulars felt it was time to upgrade both the golf course and the services of the clubhouse. Why not even serve liquor? Why give the business to bars around the city or the local package store. Why not create it in the clubhouse and put the proceeds back into the clubhouse and golf course? It could all be accomplished through a city-enforced building association, organized under the jurisdiction of the park commissioners. May Tony Marino liked the idea, which proved to be the pivotal endorsement in the process. After some early resistance from neighbors and reassurance from the Association leaders, the Association got its liquor license and was in business. “We started without a nickel in our treasury,” Imperial recalled. “But within a day or two we had raised $20,000 from members to put a makeshift bar upstairs. That was going to be our major source of proceeds.” Next, the Association narrowed down its first two goals: give the youth golf program a shot in the arm and help Steve Murphy upgrade the golf course. The improvement came hot and heavy. No. 17 fairway way rebuilt. A new green on the other side of the pond was installed. A new second floor deck was built onto the clubhouse. The men and women got new locker rooms. “A lot has happened because we’ve had a good relationship with the city and the park commissioners,” Imperial pointed out. 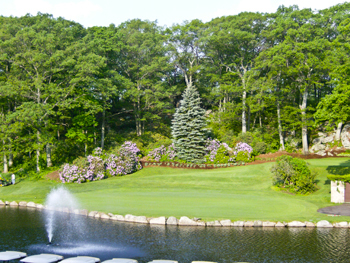 Two years ago the Larry Gannon Building Association took over from the city the operation of the course and clubhouse. The Association is paying the city $300,000 annual fee. Whatever the clubhouse and golf operations reap over that figure, the Association can put back into the property. Logically, the Association hired Murphy and Foster, doing business as Golf Facilities Management Inc., to assume the contract. “It was the obvious way to go,” Imperial said. “Mike and Steve have been the best things to happen to this place in a long, long time.” The Building Association is made up of seven members, two of whom are presidents of the Larry Gannon Men’s and Women Member Inner Clubs, Jim Tidmarsh and Joyce Agganis. Imperial joins them along with Chairman Brown, Mickey Anderson, Dave Travers and Mike Marks. Anderson and Brown are charter members with Imperial. Marks is an attorney and the group’s major connection to City Hall. The Association, a voluntary group whose members pay their golf dues like everyone else, meets the third Wednesday of every month to discuss any and all business relevant to the successful management of Larry Gannon Golf Course. “The park and the city have been great upgrading the property over the years, but everyone agrees the Association has a hands-on approach that has made the course/clubhouse a successful operation for many years now,” Imperial said.